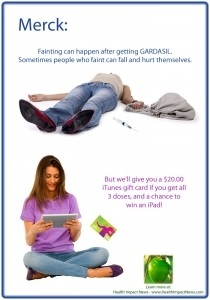 Merck Now Bribing College Girls to Complete Gardasil Vaccine – story here . Kirstie  was only 12 years old when she was diagnosed with a rare disorder for which there is no known cure, Idiopathic Thrombocytopenic Purpura (ITP). This happened just a little over a month after her second injection of Gardasil. She will live with this disorder for the rest of her life. Unfortunately, she is not alone. Gardasil and Cervarix are two of the 76 FDA approved vaccines  included in the VAERS (Vaccine Adverse Event Reporting System) database. Since Gardasil was approved for use in the United States, there have been 682 reports of ITP  after vaccine administration. 126 of these reports  occurred after HPV vaccines. If all vaccines carried equal risk, there should only be 18 reports of Idiopathic Thrombocytopenic Purpura after HPV vaccine use. Why are reports of ITP after Gardasil and Cervarix seven times that amount? When disease incidence rates are quoted, it is almost always in the context of number of cases per 100,000 people. This is not the case with ITP. 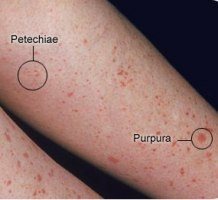 Idiopathic thrombocytopenic purpura is such a rare disorder that a diagnosis is rendered only after all other possible conditions that could cause purpura have been eliminated. This is called a ‘diagnosis of exclusion’. How many young people are living with undiagnosed ITP after HPV vaccine administration? Idiopathic simply means ‘of unknown origin.’ Frequently the word ‘immune’ is substituted for ‘idiopathic’ when referring to ITP because of the antibodies generated to specific platelet membrane proteins that cause the person’s immune system to attack their own platelets. Thrombocytopenia is the medical term for a low blood platelet count. Platelets (thrombocytes) are minute, disk shaped particles in the blood that promote clotting. When an injury causes a blood vessel to break, the platelets are activated causing them to become spiny. The resulting ‘spines’ allow them to stick to each other and the broken blood vessel walls to begin the clotting process. The normal amount of platelets circulating in a person’s blood ranges from 150,000 to 450,000 per micro-liter. When the blood platelet count falls below 20,000 the thrombocytopenia can cause excessive internal bleeding. Purpura refers to purple-colored spots and patches that occur on the skin, organs, and in mucus membranes, including the lining of the mouth. Purpura is caused by internal bleeding from small blood vessels. In short, idiopathic thrombocytopenic purpura  is an autoimmune disorder caused by immunoglobulin G  (IgG) auto-antibodies on the platelet surface. The number of circulating platelets is reduced due to increased destruction resulting in internal bleeding of varying degrees. ITP in children most commonly occurs following an infection, or occasionally following immunisation. Acute (sudden onset) ITP often resolves spontaneously within a few months. When ITP persists longer than 6 months without specific cause, the condition is considered chronic. Pinpoint red spots on the skin, often found in groups that may look like a rash, caused by bleeding under the skin. These spots are called petechiae (see photo on the right). Nosebleeds, bleeding from the gums or excessive bleeding after injury. Menstrual bleeding that is heavier than usual. Some people experience untoward, otherwise unexplained fatigue  when their platelet count is under 10,000/microl. A diagnosis of ITP is at the very least a life changing event. Worst case scenario, it can be life threatening. Kirstie from Lima NY , now 18 years of age, is one of the lucky ones. Her diagnosis of ITP after Gardasil changed her life, but she made the most of those changes. There are others who may not have been so fortunate. 18.5% of the ITP reports in the VAERS database since the time Gardasil and Cervarix were approved for use occurred after HPV vaccinations. There are at least 126 families whose lives have been changed, perhaps forever. No one knows how many others are either undiagnosed or unreported. Admittedly, a VAERS report does not prove causation. The problem with that line of thinking is that cause will never be established if no one looks for it. Do some research if you are a considering HPV vaccination. Understand the potential risks associated with Gardasil and Cervarix as well as the potential benefits. Decide for yourself whether the potential benefits outweigh the potential risks. No one knows your family’s medical history better than you. If you have been vaccinated with either Gardasil or Cervarix, be aware that ITP is a possibility. Don’t panic, simply be vigilant. Talk to your medical provider if you are experiencing unusual bruising or unexplained rashes. If you are a medical professional, consider the possibility of ITP when examining patients who exhibit unexplained purpura after administration of HPV vaccines. If you are a medical consumer, contact the FDA and CDC. Ask them why such a high percentage of ITP reports in the VAERS database occurred after HPV vaccines. Ask them why two vaccines being associated with 18.5% of the ITP reports in VAERS does not raise a red flag. Ask them why they are not ordering studies to determine whether there could be a causal relationship between HPV vaccines and ITP.